У статті розглянуті данні щодо літології, мінерального складу та геохімії осадових порід Павлівського родовища розташованого в західній частині Криворізької структури. Вивчення порід проводилось з використанням шліхового мінералогічного, гранулометричного та спектрального аналізів. Досліджувались осадові породи Павлівського родовища: первинні та вторинні каоліни, піщано-глиниста товща, еолові суглинки. Встановлено тісний зв'язок осадових порід з розломно-блоковою тектонічною будовою кристалічного фундаменту району. Відзначається збільшення потужності площадної кори вивітрювання і осадового розрізу в цілому в зонах розломів. Встановлено вплив акцесорних мінералів на металогенічну спеціалізацію порід осадового комплексу. Дослідженно розподіл хімічних елементів в осадовому розрізі, який має виражений закономірний характер. Встановлено суттєве накопичення широкого спектру хімічних елементів, що перевищують значення кларків (Zr, Y, Yb, Sc, Pb, La, Au) переважно у нижній та верхній частинках розрізу. Важливе значення має концентрація золота (100 мг/т) в четвертинних еолових суглинках району. Виконані дослідження дозволили розділити породи осадового чохла на три різновікові літолого-геохімічні зони: І - палеозой-кайнозойської кора вивітрювання; ІІ- неогенові морські піски; ІІІ- еолові відклади четвертинного періоду. Akimenko, N. M., Belevtsev, Ya. N., Goroshnikov, B. I., Belevtsev Ya. N. (1957). Geological structure and iron ores of Kryvyi Rig basin. Moscow, 280. [in Russian]. Belevtsev, R. E., Buchinskaya, N. I., Wozniak, D. K., et al. (1977). Mineralogy of the Krivoy Rog basin. Kyiv, 542. [in Russian]. Belevtsev, Ya. N., Tokhtuev, G.V., Strygin, A. I., et al. (1962). Geology of the Krivoi Rog Iron Ore Deposits. Kyiv, 484. [in Russian]. Belevtsev, Ya. N., Belevtsev, R. Ya. (1981). Geological structure and iron ore of the Krivoy Rog basin. Kyiv, 48. [in Russian]. Berezovsky, A. A. (1998). About the local stratigraphic scheme of Paleogene deposits of Kryvbas. Collected scien-tific works of the National Mining Academy of Ukraine. Dnipropetrovsk, 93-95. [in Russian]. Berezovsky, A. A. (2000). Local stratigraphic scheme of the Paleogene of the Krivoy Rog basin. Biostratigraphic and paleoecological aspects of sub-stratigraphy. Kyiv, 43-45. [in Russian]. Berezovsky, A. A., Bublik, Yu. M. (2001). Composition and structure of the Cenozoic sequence of the Gleevat depos-it of the Krivoy Rog basin. Geologo-mineralogicheskii visnik. Kryviy Rih, 66-77. [in Russian]. Vinogradov, A. P. (1956). Regularities in the distribution of chemical elements in the earth's crust. Geochemistry. Moscow, 6-52. [in Russian]. Goldschmidt, V. M. (1938). Collection of articles on the geochemistry of rare elements. Moscow. [in Russian]. Kazakov, V. L., Paranko, I. S., Smetana, N. G., and al. (2005). The natural geography of Krivbass. Kryviy Rig. [in Ukrainian]. Korzhnev, M. N., Kurilo, M. M., Zahariy, N. V. (2014). 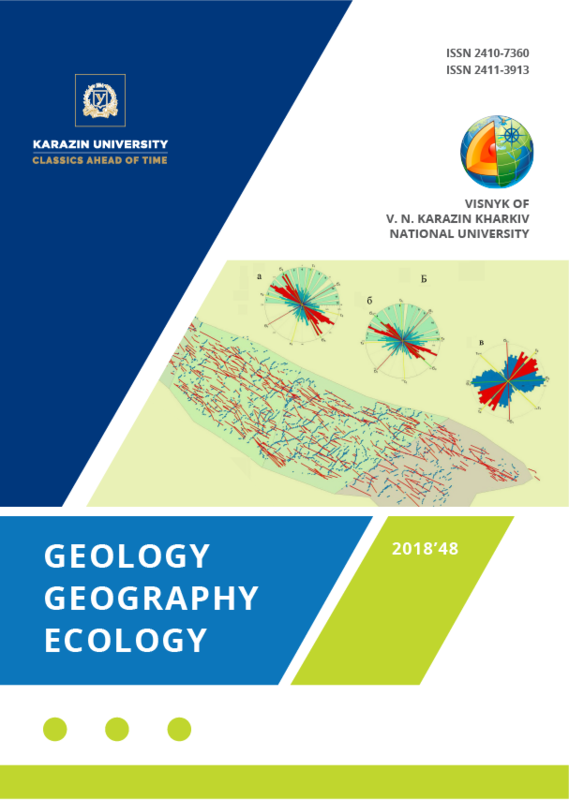 Resource and ecological criteria for determining the assimilation potential of the geological environment by the example of the mining regions of Ukraine. Bulletin of Tomsk State University, 243-252. [in English]. Kuznetsov, V. G. (2007). Lithology. Sedimentary rocks and their study. Moscow, 511. [in Russian]. Makarenko, D. E. (1959). Paleogens in the pits of the part of the Ukrainian crystal shield. Geological journal, 1, 47-56. [in Ukrainian]. Malakhov, I. N. (2009). New geological force. Krivoy Rog, 312. [in Russian]. Paranko, I. S. (1993). Some features of the development of the Krivoy Rog structure. Geological Journal. Kyiv, 112-133. [in Russian]. Perelman, A. I. (1979). Geochemistry: Textbook for geological specialties of universities. Moscow: Higher School, 423. [in Russian]. Stetsenko, A. I., I.Vanchenko, V. V. (2016). The main sources and factors of technogenic influence on sedimentary rocks of the central part of Kryvbas. East European Scientific Journal, 12 (1), 39-46. [in Ukrainian]. Troschenko, V. N. (1973). Plagiogranite-migmatite complexes of the Krivoy Rog-Kremenchug zone and small sub alkaline granitoid intrusions. Geological structure and prospects of the Kryviy Rih's ore at large depths. –Kyiv: Naukova dumka, 29 - 31. [in Russian]. Cholodov, V. (2006). Geochemistry of the sedimentary process. Moscow. "Geos", 608. [in English]. Scherbak, N. P., Bartnitsky, E. N.; Lugova, I .P. (1981). Isotopic geology of Ukraine: monograph. – Kyiv: Scientific Opinion, 247. [in Russian]. Changes in river sedimentation caused by the influence of the modern system of Ukraine. Third Plenary Confer-ence and Field Trip From the Caspian to Mediterranean: Environmental Change and Human Response during the Quaternary. Astrakhan, Russia 22-30 September 2015. Proceedengs, 91-96. [in English]. Molding material for foundry production from construction sand of Krivoy Rog: Materials of the XVIII Scientific and Technical Conference of Young Professionals. Krivoy Rog, 2004, 17 – 18. [in Russian].